Cyberdust, obsoledge, and other visions of tomorrow from the people who introduced Future Shock in 1970. Carlos Slim Helú–the world’s richest man–Steve Case, and seemingly half the military-industrial complex are gathering at a private club in Washington D.C. this morning to honor the husband-and-wife futurists Alvin and Heidi Toffler on the 40th anniversary of their first and most influential book, Future Shock. 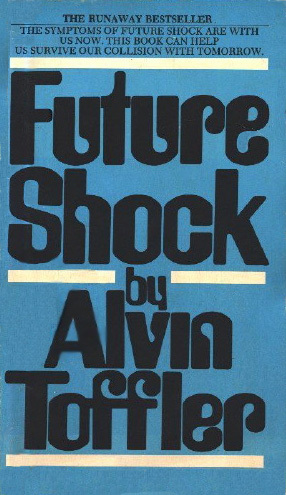 Published under Alvin’s name in 1970, Future Shock added “information overload” and “prosumer” to the lexicon, along with its title–which refers to the culture shock that results when the culture that’s changing so fast it feels foreign is your own. Today’s invitation-only event is essentially a retirement party for the pair, structured as an opportunity to reflect on their track record. And, as part of the proceedings, Future Shock is revisited–and spun forward. Many of the new Tofflerian predictions are merely predictable: China will rise; cities will grow; Social Security will cease to exist, and Iran’s leaders will remain irrational. Oh, and “work will continue to expand to fill whatever time and space is available.” We should have known. Other scenarios are the breathlessly blue-sky, cornucopian forecasts you’d expect from the Tofflers and their acolytes: nanotech factories; quantum computing; resource wars giving way to limitless fresh water and clean energy, and bio-implants further blurring the line between man and machine. The Singularity may not be near, but it’s coming. The remainder bears testimony to the opportunities and vulnerabilities of a relentlessly networked world. Crowdsourcing becomes ubiquitous, evolving into a hybrid of networks like Innocentive‘s and the tight-knit, ad hoc communities seen in massively multiplayer games like World of Warcraft. Technologies are no longer developed in-house. Corporate R&D becomes hyper-specialized, and the most successful become increasingly adept at integrating large problem-solver networks into their formal organizations. “Answer seekers” are linked with “problem solvers” across the globe. “Philanthro-capitalists” and “hyper-empowered individuals” accumulate wealth, networks, and resources that exceed those of nation-states. Bill Gates, who will do more to eradicate malaria than any NGO or government, is an example of the former, while Oscar Morales, the engineer who used Facebook to organize million-strong protests against the Colombian rebels of FARC, is a harbinger of the latter. Prosumers and “prosumption” will evolve into a form of radical transparency, as the proliferation of industrial-strength analysis tools mean individuals can peer inside companies and tell others that they see. These are the descendants of Michael Burry–the Asperger’s-enhanced protagonist of Michael Lewis’ The Big Short, who spent untold hours reading CDO prospectuses–and the plane-crazy denziens of FlyerTalk, who have developed their own tools for prying open airline reservation systems and forcing industry executives to accede to their demands. The biggest threats to national security are “cyberdust” and “obsoledge.” Cyberdust is what data gathers while it sits on the military’s and intelligence agenices servers, collected but unanalyzed due to the mounting data glut. “Obsoledge” is knowledge that is obsolete–an increasing hazard as the pace of everything, including change itself–accelerates. “There will be a lot of stuff we just don’t know,” says Deborah Westphal, the managing partner of Toffler Associates. “How do you know what’s true and what’s non-true? How do you validate that? And cyberdust is just stuff sitting around, that we don’t even know is there. And that’s the most dangerous kind. There’s going to be an explosion of business opportunities in analyzing that data, and the military and intelligence will have to figure that out.